Eastern Germany entices with a broad pallette of unique offers rather distinct and different from the western regions. Quedlinburg, a small town of about 23,000 inhabitants, near the Harz Mountains in western Saxon-Anhalt, virtually the heart of Germany, is a treasure which is rapidly evolving into a prime tourist attraction particularly for non-Germans. A rare combination of ancient , medieval and modern historical and artistic treasures are making it a "must" for visitors, much as Rothenburg, Trier, Lübeck and other German historical gems. Unlike the others, such as Aachen, where Charlemagne (Karl der Grosse) held sway over the Franks, Quedlinburg is the birthplace of a Nation. For it was here in 919 A.D. that a Diet of noble ducal peers elected a German King, the Saxon Duke Heinrich, monarch of Germany-everything--, rather than merely a ruler of a local domain such as Bavarian or Rhenish or Hessian lands. And this first hegemony extended for more than three centuries until Germany dissolved into almost 300 tiny city-states, provinces and squabbling communities, only to be reunited in 1871. The modest cottage in which Heinrich was informed of his selection and presented his insignia of office lies at the foot of the Schlossberg. In this stately castle where the impressive Quedlinburg Treasure again sits safe and sound in the confines of the St Servatius Church. The edifice, first begun around 1000, is a prime example of Romanesque architecture which towers above some 1300 half-timbered houses in mostly restored conditions, covering an eight-century span. 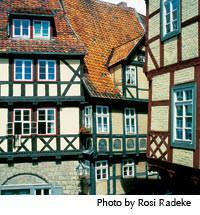 A museum chronicles the development of half-timbered construction. Particularly notable is the fact that these houses are restored using original building materials unlike a lot of other recovered "Halbfach" buildings Germany-wide which are only superficially "re-cycled." This UNESCO World heritage Site, one of some 750 worldwide (among the other German sites between the Mid-Rhine Valley and Wismar at the Baltic Seacoast) has seen ever-increasing numbers of foreigners enjoying a plunge into the Middle Ages especially since 1993 when the Site status was proclaimed. Aside from being the "capital" of a Reich, the Reich as such, Quedlinburg also evolved as an important crossroad for trade. Its spacious market place gives eloquent silent testimony to that aspect. Additional riches from mining in the outlying Harz mountains brought additional prosperity to the town. The impressive graves of King Heinrich I and his Queen, Mathilde. And the gilded and bejeweled artifacts belonging to the Treasure along with the great holdings of the Damenstift (religious foundation or trust) reveal the wealth and magnificence of this totally typical Middle Age town. At the foot of the castle the Age of Enlightenment and that of Sturm und Drang,( the harbinger of the Romantic literary movement of the outgoing 18th Century,) interface with the art of the 20th Century. Feininger was the prime spokesman of the Classical Modern epoch bridging Historicism, the Belle Epoche/Art Nouveau- Expressionism and Cubism, being himself a prime spokesman for the Bauhaus style with its worldwide implications. Situated within an hour of the legendary Brocken Peak, surrounded by lush, deep green forests, plentiful winter sports facilities, limitless summertime campsites, trails, swimming and bathing facilities, and fantastic mountain vistas made accessible by narrow-gauge steam railways, Quedlinburg easily vaults the time barrier between the earliest traces of German history and the 21st Century. 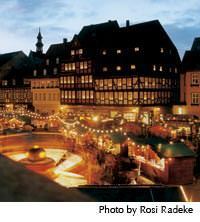 Nothing in all Germany is more central to its many epochs, historical or artistic. 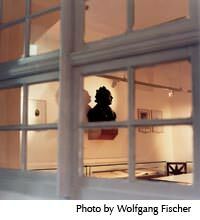 Performance art, pictorial exhibitions and special events further enhance its timelessness. More than 300 travel professionals from all over the world recently returned to the medieval city of Quedlinburg re-acquainting themselves with the UNESCO World Cultural Heritage town as part of the German National Tourist Office's annual German Travel Mart - GTM. The GTM is a week long exhibition, booking event - conference which kicks off with a series of preliminary tours highlighting the nation's most cherished destinations. Hundreds of German destinations welcome travel specialists every year enticing tourists from far-flung corners of the globe. In anticipation of the 500th Anniversary of the Protestant in 2017, when Martin Luther posted 95th theses and proposed reforms of the Roman Catholic Church in 1517, centrally-located Sachsen-Anhalt, was selected to host this year's GTM because it is the geographical mid-point of the rise of German Protestantism lying between the states of Thuringia, Saxony and Brandenburg. Located in the province of Sachsen-Anhalt, Quedlinburg co-hosted this year's festivities with state capital Magdeburg, welcoming journalists, tour operators, travel associations and presenters to a gala opening event. Although long-known for its more-than-2000 fully-restored half-timbered houses, spectacular Romanesque cathedral (the seat and coronation site of the Saxonian line of German kings dating back 1100 years,) a very long contemporary arts and literary heritage anchored in a medieval setting, a new aspect of Quedlinburg's hospitality - its gastronomy was spotlighted as local regional culinary treats revealed yet another aspect of Quedlinburg's evolution as a tourist destination. "Who would have thought...?" The travel "profis" attending the GTM kick-off in Quedlinburg actually raved about the sumptuous buffet dining! One enthusiastic guest even said, "It was the best opening dinner at GTM in at least 10 years!" Quedlinburg's culinary achievements were lavishly praised by others guests as well as top chefs from its local restaurants and hotels showed their best efforts. In addition to the regional Harz Mountain specialities and traditional Thuringian-Saxon fare, Quedlinburg's kitchen now also include modern, locally-sourced products for the contemporary, lighter diet preferred by most folks be it home-towners or travelers. These were presented as well along with International and ethnic cooking treats as found in larger cities. These taste treats included Italian, Greek, Thai, Chinese, Japanese, and Indian to name a few. Given Quedlinburg's proximity to the great cities of the Reformation including Wittenberg, Leipzig, Erfurt, Mansfeld, Erfurt, Eisennach and the birthplaces, important sites and last resting places of key personalities, including Luther, Melancthon, JS Bach and virtually hundreds of others, Quedlinburg's lower-priced, high quality hotels and dining make it a preferred place to stay when venturing out on day trips to those historical locations. Not generally known is the presence of one of Germany's finest and oldest albeit smaller wine growing areas - Saale Unstrut. Its best producers' wines are eagerly sought by connoisseurs world-wide. Indeed, these wines were the first offered congregants of the new faith by the "Reformed Church" half a millennium ago. Riesling, Silvaner, Pinot blanc whites, Pinot noir, Zweigelt and Portugieser reds rank high on the lists. For a free glimpse of what awaits visitors to Quedlinburg, go to YouTube and visit the various narrated walking tours of the town. 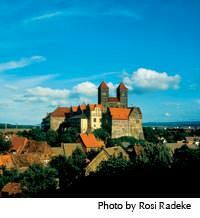 It truly is a modern German town anchored in the early Middle Ages with a contemporary flavor and cultural offerings for all throughout the year. No need to wait for 2017 to "savor the flavor!" It's all there right now.